So I meant to post this last Friday but I ended up getting behind and was just too busy last week. Then I was going to find time and post it on the weekend but then I pretty much wasn't at home all weekend so then I had to push it back even more. You guys know that I love all thing beauty and makeup and because of this I love writing about it! 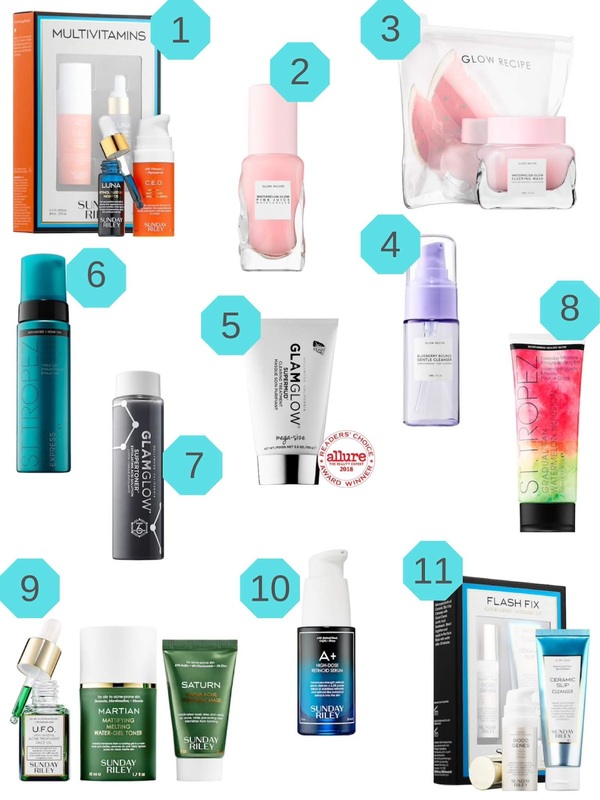 So I think I would share some of the things that I've had my eye on at Sephora for quite a while now! I have been really interested in the Sunday Riley products that Sephora has but they are sooo expensive. Since the last time I was looking at their products they've come out gift packages which I think is such a great idea for companies to do because it allows customers to be able to test out products without buying the full size first. I tend to have sensitive skin and I'm usually pretty reluctant to try out new products, especially ones that are so pricey. But I've heard that Sunday Riley has some great acne products and some scaring products. They also have some anti-aging products which are basically all products I'm highly interested in since I'm not getting any younger! I also have been interested in the Glow Recipe products. I haven't read any of the reviews but the products seem really interesting! I also like their packaging and how they have mini trial sizes to test out. I also like how they are made of out fruit products and other natural ingredients! One of my favorite brands is Glamglow and I absolutely love trying their new products whenever they come out with them. Also my favorite like by them is their supermud mask and I really want to try out the supertoner and see if it works well for my skin type! I also love using St. Tropez items especially around this time of year so I can make sure I get my tan on! I currently have really tan feet though because I sit outside for lunch and my lunch is an hour long and so my feet are getting really tan because I usually wear pants every day to work. On the days that I wear dresses then I tend to get sunburnt knees and now I've recently started getting tan knees so I basically have the most strange/farmer's tan ever!